Nestled among the scenic bluffs of downtown Winona, MN, the Alexander Mansion Bed and Breakfast is a luxurious turn-of-the-century Victorian mansion that offers charming bed and breakfast accommodations and gracious hospitality. Built in circa-1886 and once home to Winona’s elite, the villa has been lovingly restored to its former glory and celebrates the grand lifestyle of a bygone era. Blending elegant style with modern-day comforts, the bed and breakfast inn features well-appointed and tastefully decorated guest suites with period antiques, fireplaces, private bathrooms and upscale amenities. A gourmet breakfast is served every morning by candlelight in the antiques-filled dining room and features fresh, locally sourced ingredients, and business amenities such as workstations and complimentary wireless Internet for available. Other facilities include a charming tea room and elegant lounge, a large verandah and beautiful gardens, and a free shuttle to the Inn from the marina and the train station. 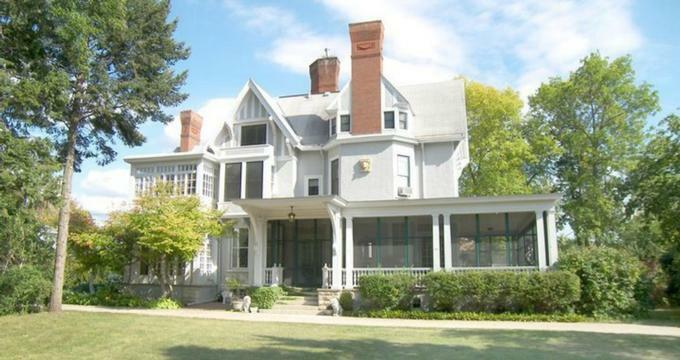 The Alexander Mansion Bed and Breakfast is ideally situated for a quiet, relaxing getaway or for exploring the Winona, and is a short walk to Lake Winona and an 18-mile drive to Great River Bluffs State Park. The Alexander Mansion Bed and Breakfast feature five beautifully appointed guest rooms and suites, each of which is individually decorated with period antiques, plush beds, elegant sitting areas with fireplaces (upgraded suites), and en-suite bathrooms with soaking tubs and walk-in showers. Modern amenities in each room include air-conditioning, flat-screen televisions with cable channels, CD/radios, alarm clocks, hairdryers, irons and ironing boards, and complimentary wireless Internet. The DC Alexander Suite Bedroom is a deluxe suite with a Renaissance Revival canopied king-sized bed in luxury Frette linens, and an en-suite bathroom with an original soaking tub with shower, fluffy towels, bathrobes and J. R. Watkins Natural Apothecary personal products. A sunroom has a window seat overlooking the beautiful gardens, an antique fireplace, and deluxe guest services include an evening turn-down service and daily housekeeping. The Maude King Alexander Suite features an antique canopied queen-sized bed in luxury Frette linens, and an en-suite bathroom with an original soaking tub with shower, fluffy towels, bathrobes and J. R. Watkins Natural Apothecary personal products. An inviting Victorian sitting area has comfy armchairs and a hand-carved period fireplace. Martha’s Room is exquisitely decorated with a full-size antique canopied feather bed in luxury Frette linens, and an en-suite bathroom with an original soaking tub, fluffy towels, bathrobes and J. R. Watkins Natural Apothecary personal products. The room has a comfortable sitting area with a window seat and garden views, and in-room amenities in this room include a ceiling fan and air-conditioning, antique toys and dolls, and complimentary wireless Internet. Mary’s room is a simple and elegant east-facing room with a queen-sized bed dressed in luxury Frette linens, and an en-suite bathroom with a shower, fluffy towels, bathrobes and J. R. Watkins Natural Apothecary personal products. The room has a comfortable sitting area, and in-room such as air-conditioning, and complimentary wireless Internet. Named for Judge Thomas Wilson, the builder of the mansion in 1886, the Judge Thomas Wilson Suite is a sunny cottage-style suite located on the lower level of the bed and breakfast inn. The room features a queen size bed dressed in luxury Frette linens, and an en-suite bathroom with a claw foot tub and shower, fluffy towels, bathrobes and J. R. Watkins Natural Apothecary personal products. Large enough for a long-term stay, the suite has a fully equipped kitchen with a blender, microwave, stove, microwave, and refrigerator/freezer. A spacious living room offers a comfortable queen sofa sleeper for additional guests and a storage area for skis and other outdoor equipment. A complimentary gourmet breakfast is served in the elegant dining room every morning, as well as in the private parlor, where there is a secluded enclave for two. Prepared with fresh and locally sourced ingredients from regional farms and producers, breakfast includes fruit juice and beverages of choice, fresh fruit, sweet bread, scones, or muffins, savory egg dishes such as quiches and vegetable frittatas. There are also delicious choices such as creamy vanilla ice cream sundaes. Deluxe amenities at the Alexander Mansion Bed and Breakfast include a gourmet breakfast served in the dining parlor every morning, complimentary bottled spring water, coffee, teas, hot chocolate, cold beverages, and snacks throughout the day, and a welcome wine social in the evening. Guest amenities include an evening turn-down service, personalized concierge services, a complimentary pick-up at Winona marina and Amtrak station, and complimentary wireless Internet around the property.